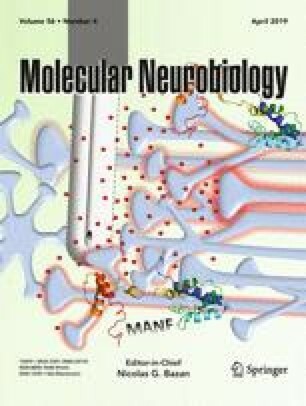 The pathological form of amyloid beta (Aβ) peptide is shown to be toxic to the mitochondria and implicates this organelle in the progression and pathogenesis of Alzheimer’s disease (AD). Mitochondria are dynamic structures constantly undergoing fission and fusion, and altering their shape and size while traveling through neurons. Mitochondrial fission (Drp1, Fis1) and fusion (OPA1, Mfn1, and Mfn2) proteins are balanced in healthy neuronal cells. Glia maturation factor (GMF), a neuroinflammatory protein isolated and cloned in our laboratory plays an important role in the pathogenesis of AD. We hypothesized that GMF, a brain-localized inflammatory protein, promotes oxidative stress–mediated disruption of mitochondrial dynamics by alterations in mitochondrial fission and fusion proteins which eventually leads to apoptosis in the Aβ (1-42)–treated human neuroblastoma (SH-SY5Y) cells. The SH-SY5Y cells were incubated with GMF and Aβ (1-42) peptide, and mitochondrial fission and fusion proteins were analyzed by immunofluorescence, western blotting, and co-immunoprecipitation. We report that SH-SY5Y cells incubated with GMF and Aβ (1-42) promote mitochondrial fragmentation, by potentiating oxidative stress, mitophagy and shifts in the Bax/Bcl2 expression and release of cytochrome-c, and eventual apoptosis. In the present study, we show that GMF and Aβ treatments significantly upregulate fission proteins and downregulate fusion proteins. The study shows that extracellular GMF is an important inflammatory mediator that mediates mitochondrial dynamics by altering the balance in fission and fusion proteins and amplifies similar effects promoted by Aβ. Upregulated GMF in the presence of Aβ could be an additional risk factor for AD, and their synergistic actions need to be explored as a potential therapeutic target to suppress the progression of AD. This work was supported by National Institutes of Health Grants NS073670 and AG048205, and Veterans Affairs Merit Award I01BX002477 and Veterans Affairs Research Career Scientist Award to AZ.